Facebook Audience Network does not support video. Okay, I can still use this over Admob for Android since that apparently is broken. Thanks for this extension! Hi, it must work with other Extensions like Admon. Didn't now Admob is broken for Android. Maybe I will look in to that aswell, i use Admob in older project and i wanna update my older project with Facebook Audience Network in combination with Admob. 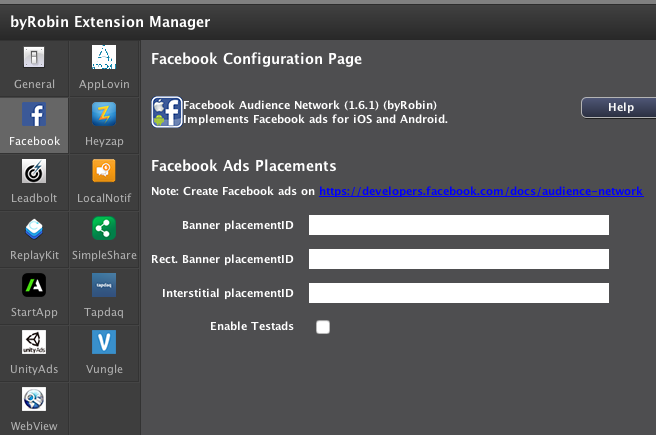 Because if a user does not have a Facebook account, Facebook will not show ads, than Admob take it over. Google has brought the Admob SDK to Google Play services, it's no longer separate. I also believe that the separate SDK has been killed which is why users are reporting problems. robinschaafsma can you share what ecpms are you getting with this? i'm waiting the review process and i'm just curious about the performance of these ads...there are not many posts about it on internet..
Not yet, i have not implemted it yet, if i have more info. i 'll let you know. robinschaafsma i'm having problems implementing this extension on my game. I have enabled it and i use the block to initialize facebook interstitials on my first scene , but whenever i use the block to load an interstitial it crashes my game ...could you take a look ?? It seems like he can't find getInstance methode. On my side i don't have that error. Deed you try to Run a clean project first? yes robin, i did clean project several times...dont know why it continues crashing my game....do you have any ideas?